Proper turnout of horse and rider has a long history of which we strive to maintain with utmost respect. Hunt accessories seem to be getting harder and harder to find these days. 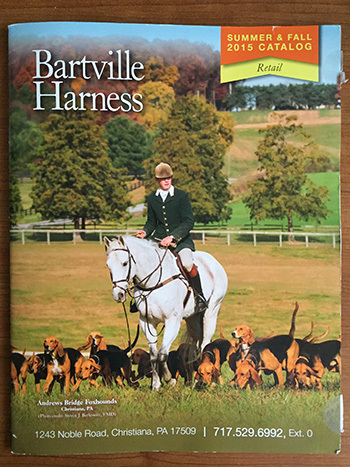 Aside from Ebay, we have a couple favorite suppliers, Horse Country and Bartville Harness. Horse Country is located in Warrenton, VA. They have a website, www.horsecountrylife.com as well as an online store at www.horsecountrycarrot.com. 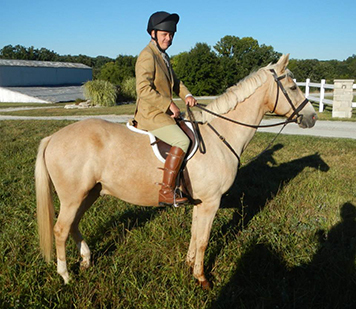 Bartville Harness is owned by Amish in Christiana, PA and they make quality, hand made hunt tack and accessories. They do NOT have a website, and only take checks. Here is a PDF sampling of hunt items that they sell. Please feel free to call them at (717) 529-6992, Monday through Friday between 8:00am and 8:30am E.S.T. or leave a message anytime at ext 0 (please no Sunday messages) and ask for a catalog of your own. When leaving a message, please include your name and phone number as well as correct mailing address. A member or guest of a recognized Hunt should no more think of turning out garbed in nondescript fashion than he would think of dressing in golf clothes to go to the theatre, or to a wedding. There is a definite and authoritative regulation as to attire and to uphold the quality and excellence of one's Hunt, it should be a matter of personal pride to see that the rules on proper attire are thoroughly understood, and scrupulously followed. 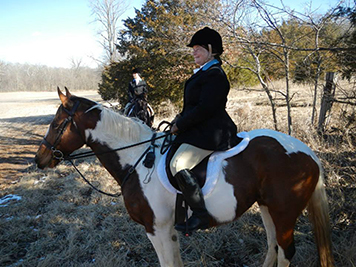 There are two groups comprising the Bridlespur Hunt: regular members, and members who, in recognition of valuable service to the Hunt, have been invited by the Master to wear the Hunt button. Members of the latter classification are commonly referred to as members "with colors." On formal hunting days, regular members wear formal black. Ladies and gentlemen with colors can be distinguished by their attire on formal days: gentleman wear formal scarlet and ladies wear formal black with robin's egg blue collars. Gentlemen canary vests, and ladies robin's egg blue vests. On informal days, all members dress in ratcatcher, except members of the hunt staff who always dress in formal scarlet. This includes lady Masters and Ladies serving as huntsman or whippers-in. Non members hunting as guests come attired the same as regular members. Some exceptions are made for children and are noted herein. 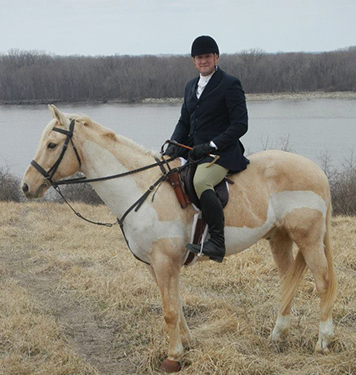 When hunting out of town with another hunt it is not appropriate to wear your colors unless it is a joint meet or you have secured permission from their Masters to wear your colors. Black or dark blue melton, or hard finished lightweight. (Never velvet). Collar of coat material. White shirt with properly tied white stock tie, pinned with plain gold stock pin worn horizontal. Black Derby with hat cord or black velvet hunt cap, or ladies may wear top hat with shadbelly coat. Hair arranged neatly in hairnet. No earrings. Plain black leather dress boots (not field). White or yellow string, brown, tan or natural leather. 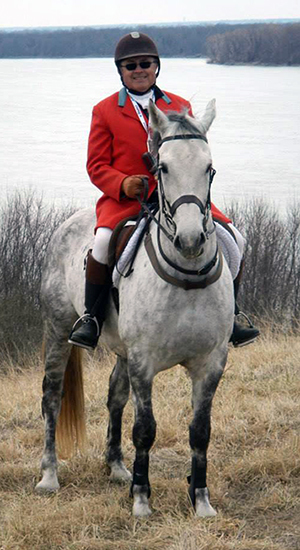 under 16 may wear tweed coats with tan or black boots, or jodhpur boots, and must wear hunt caps with safety harnesses. Black or dark blue melton, or hard finish lightweight. Robin's egg blue collar, black bone buttons, with BH engraved thereon, or black shadbelly with engraved buttons. Ladies - robin's egg blue vest with brass buttons engraved with BH thereon. Black with black patent tops and garter straps of patent. Blunt spurs with black leather straps. White stock, neatly tied with plain gold safety pin fastened horizontally. Black hunting derby with black hat cord, or black velvet hunt cap. Top hat may be worn with shad belly coat only. Hair net is mandatory. No earrings. Lady's hunting whip with thong. Formal Scarlet is worn only by Gentlemen who have been awarded colors and by Ladies of the Staff who have colors. Scarlet, single breasted frock, with robin's egg blue collar, or formal cutaway from shadbelly; four button closing (except for Huntsman or Master who will have five button closings to carry a horn). Polished brass buttons with BH engraved thereon. Canary with brass buttons with BH engraved thereon. Black with brown boot tops, tabs sewn on but not down, white buck garter straps. Blunt spurs, with black leather spur straps. Top Hat with scarlet hat guard fastening inside of coat collar, or velvet hunt cap with ribbons turned up. Staff will wear only black velvet hunt cap with ribbons turned down. White stock, neatly tied, with large plain gold safety pin worn horizontal. To be worn during Cubbing Season and on Weekday hunts during Formal Season, except staff who dress formally at all times. Hacking jacket of subdued color in solid, check or tweed. Of conservative complementary color, optional. Ratcatcher with tab collar and stock pin, or shirt and tie. Brick, Brown, Buff or Canary. Black or brown leather, Field or Dress. Velvet Hunt Cap or Derby, Black or Brown. Ladies to arrange hair neatly in hair net. Hunting Whip with thong, optional. NOTE: Rubber boots are to be worn only with rain coat on rainy days. Rain coats should be of conservative colors, tan, brown, dark green, natural.